Blue. I thought it was blue. But the name is “Gray”. so, ok: Blue-Gray. Or maybe Dark Gray with a very blue base? Very creamy. Opacity on “10”. The formulation and applicator brush (wide and flat) is similar to the Sally Hansen Insta-Dri colors. And it dried fairly quickly, so that’s a #win. I added a few light blue dots just to set off the color. I think the light blue dots made the gray look even more blue. lol. I just can’t give up on the idea that this is blue – not gray! 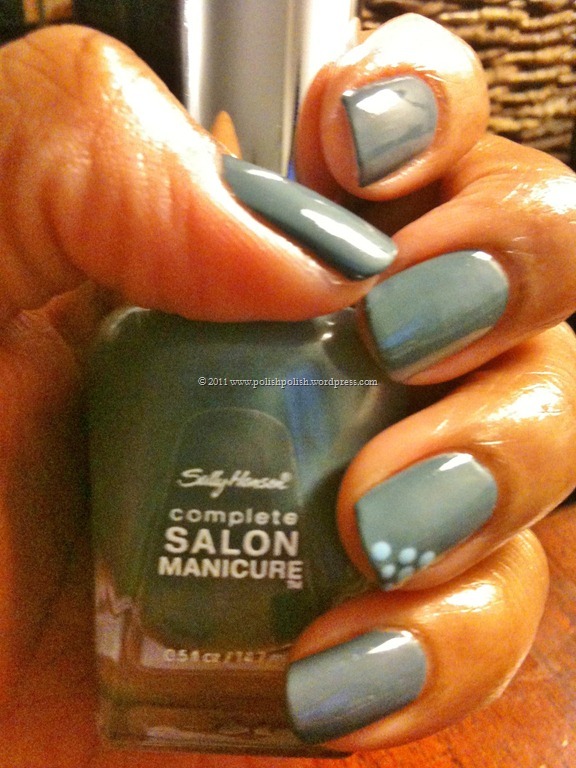 This entry was posted in Sally Hansen, Sally Hansen Complete Manicure and tagged blue, complete manicure, Gray, Gray by Gray, What's With the Cattitude.